There are plenty of brokers now offering their services to the new traders around the world. You don’t have to go to anyone physically to sign up with them. All the brokers now have their own websites where they provide smooth and real-time trading services. One of the top brokers in the world today is HotForex. This broker has definitely made a name in the new traders. All of its platform features and trading conveniences have been designed with new traders in mind. Let’s get into this review to know more about its suitability as a broker for new traders. The first thing you have to love about this broker is how it has proved itself as one of the best brokers in the world with its services. It is not a false claim because there are numbers and figures to prove the point. To this day, more than 1,300,000 accounts have been created on its platform. What makes that number even more interesting is the fact that this broker has been around for only eight years. With its international presence, the broker has now translated its website into 27 languages and has won 20 awards so far for how amazing its services are. The trust from the traders is not without a reason. HotForex is fully regulated and its website is run by HF Markets, an entity that gets regulated by Financial Services Commission. It is a properly registered company and provides its services to traders from around the world only legally. There is nothing to complain about the trading platform and conditions from HotForex. It has been mentioned already that this broker has designed its features with new traders in mind. 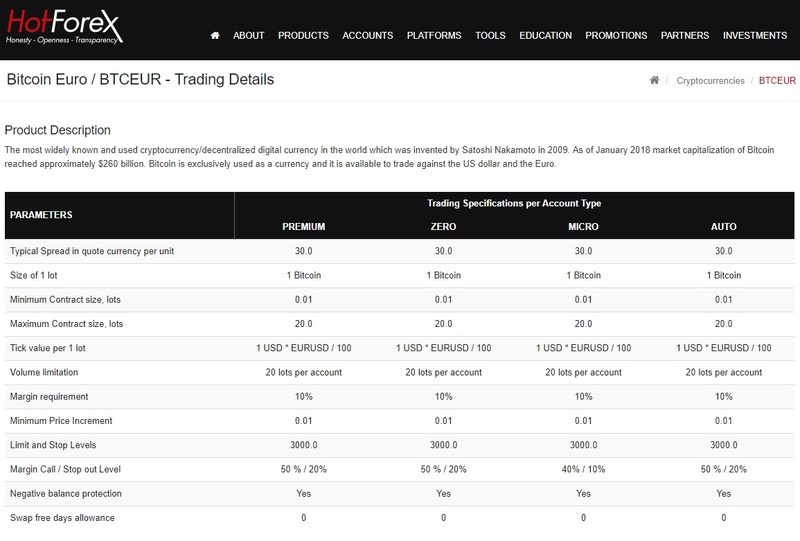 The trading platforms that you as a trader will get access to are MetaTrader 4 and MetaTrader 5. These are two of the best trading platforms liked equally by traders and brokers from around the world. HotForex has done a great job by bringing both the great platforms to all the devices that modern traders like to use. Both MT5 and MT4 are available on Android devices, iPhones, desktop computers, and iPads. Most importantly, you have the web-based version of the platform as well that can be accessed by anyone from anywhere from any device. 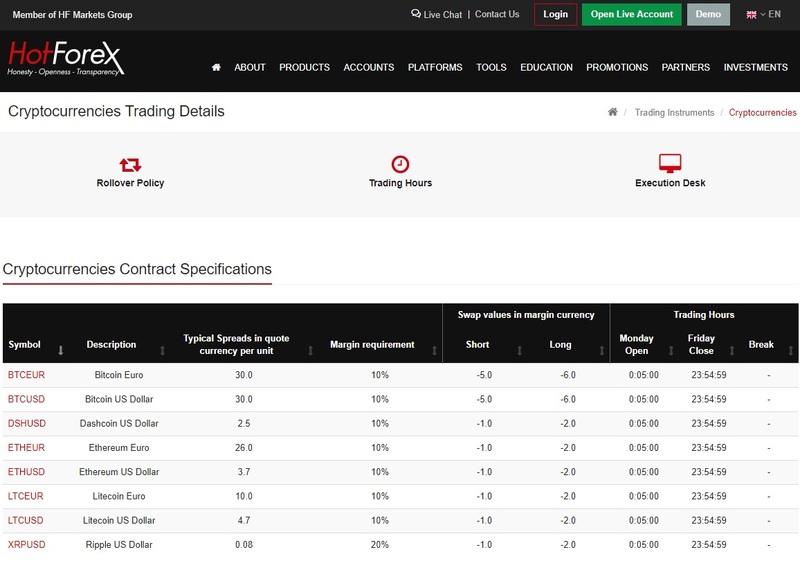 When you look at the trading conditions, you have to admire how HotForex makes things so easy for its traders. The biggest barrier that has kept you from opening an account with other brokers is not going to be a hurdle when you sign up with HotForex. Mainly, you have three different accounts to choose from: Premium, Zero, Micro. Micro account requires only $5 as an initial deposit whereas the initial deposit for Zero account is $100. Zero account lets you enter trades with 0pip spreads. The minimum spreads with Micro and Premium accounts is 1pip. On HotForex Bitcoin is exclusively used as a currency and it is available to trade against the US dollar and the Euro. HotForex – What to Trade? Industry’s best trading platforms are not the only best things you will get from HotForex. You will also love how you can trade so many different assets that belong to such a wide range of asset classes. You can trade energies, commodities, metals, bonds, currencies, cryptocurrencies, shares, indices, and much more when you are on the HotForex trading platform. It needs to be mentioned separately here that you can trade quite a few cryptocurrencies when you sign up with HotForex. Naturally, most of the traders think they will only be able to trade ethereum and bitcoin. However, things are quite different with HotForex. When you have signed up with HotForex, you can trade Ripple, Litecoin, and even Dashcoin in addition to ethereum and bitcoin. In most cases, you will only have to maintain a 10% margin when you trade cryptocurrencies on HotForex. The only exception is when you are trading ripple for US dollar. In this particular case, the margin requirement is at 20%. The best thing is that you can take a long or short position on your trades. As a new trader on HotForex, you get access to the highest quality of trading education. You just have to decide which content type best suits your learning style. If you like to go at your own pace, you can go with the ebooks and tutorials. However, if you are in a hurry to start your trading career and not wait any longer, you can watch the training videos. The good thing is that you have access to this training material as soon as you open an account with the broker. What’s more admirable is the webinar section on the website. Now you can join webinars and get live training from the best experts and the most experienced traders in the market. HotForex goes many steps ahead of other companies when it comes to providing customer support. It provides a bunch of phone numbers on the website for different countries where the traders can call and get help. In addition to that, it has given several email addresses that you can use based on the type of inquiry you have. This way, you get a response quickly and from the professionals who know the best about your issue. There is customer support available in Chinese, Arabic, and Farsi as well. You can contact the customer support during the working days. Last but not least, you can talk to an agent live on the website through the live chat feature. If you are ready to open an account with HotForex, you should not have any issues during the signup process either. You have all the safest methods of funds transfer and withdrawal available as well. These deposit options include credit cards, bank transfers, crypto transfers, and the many online payment options. You can look at these features and clearly tell that the broker is focused to make its platform convenient for new traders. If this is the first time you are going to trade various financial assets, especially cryptocurrencies, you can go with HotForex without any hesitation. Cryptopia Market Paused and Then Hacked – Was This a Scam or a Hack?